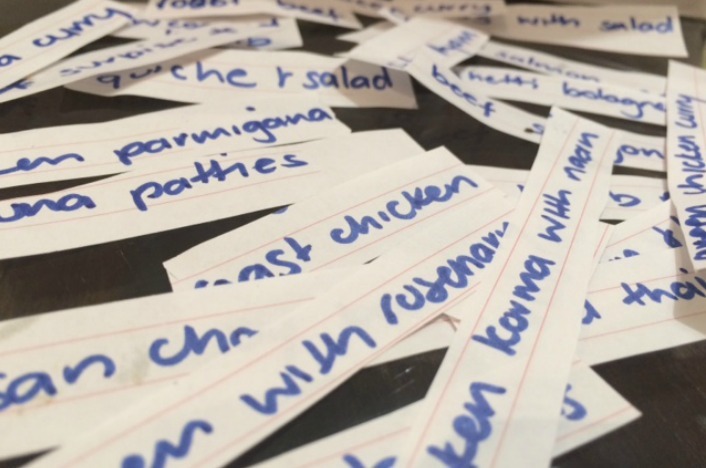 It was just over a year ago when I wrote about how our family had cleverly solved the ‘What’s for dinner tonight?’ issue. Each family member had been given their very own week to control the menu planner. A roster had been drawn up, and a weekly meeting took place on a Saturday to allow for discussion. When it was your week you got to choose what the family would eat. The power was intoxicating for all. It’s fair to say the weekly rotation did well for about eight or nine months. The first few months were an absolute hit, I never had to ask for the menu plan to be done, it just happened. The little travellers were keen to be in control. And then the schedule became like all schedules: dull, monotonous, and a chore. “It’s your turn to do the menu” someone would whine, “But I only just did it!” someone else would whine back. Last night, the second little traveller came up with a brilliant plan. “I have an idea” she said with a wink. Over dinner I sat with a pen and paper and wrote down their ideas as they came. “Soto Ayam – and Henry can’t complain!” said the second little traveller. “Green Chicken Curry” an obvious and continual request from the fourth. “Roast Beef” said our carnivorous third child. “Salmon and Asian Vegetables” G’s favourite. “Yellow Chickpea Curry” the first kicked off with a vegetarian option before following up with “and Tuna Patties”. “Tacos” the third needed more meat. “Chicken Korma and Naan bread” I tried to balance it out. “Chicken with Rosemary” the one thing we’ll all eat without complaint. “How do we ever get to have anything new though?” the first traveller asked. 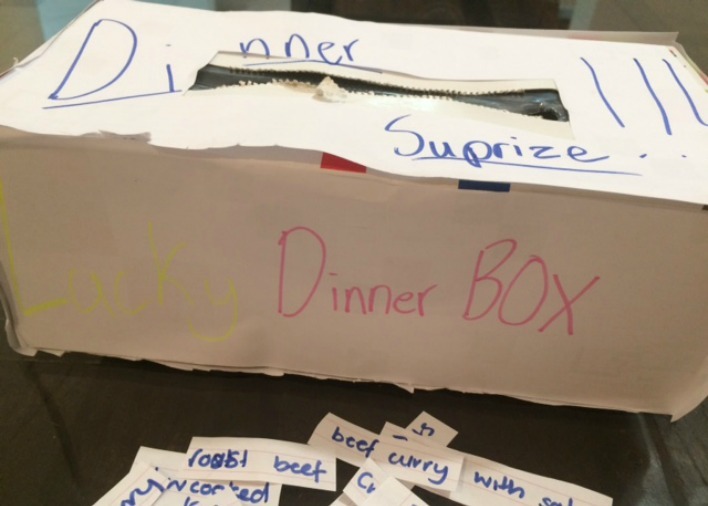 An addition was decided, the “surprise” dinner draw where something had to be chosen from a cookbook. I added it to the list. Scissors were collected, and we folded and placed them into the box. 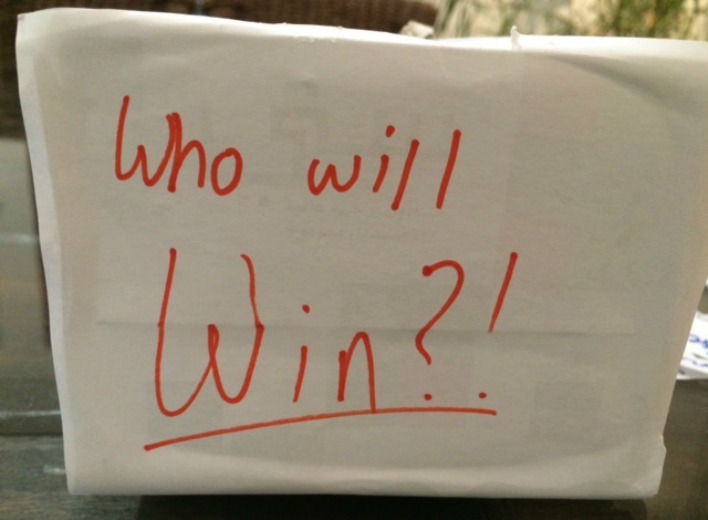 As she wandered off with a smirk I studied the lucky dinner box carefully with one thought on my mind. How long it would take for the first fist fight and a demand for a redraw. Do you think it’ll work? How do you decide? Is it a democracy or a dictatorship at dinner time in your house?